Home » Blog » What is Cognitive Behavioral Therapy for Insomnia (CBTI)? Sleep Drive – How tired we are, which is related to the number of hours of being awake. Circadian Clock – Tune our internal biological clock to direct us to go to sleep at the right time. Flight-or-Fight system – Reduce stress to avoid being hyperaroused when we need to go to sleep. 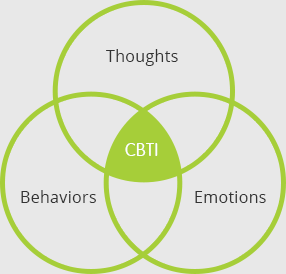 The CBTI protocol aligns these system through a set of behavioral modifications that changes bed time, wake up time and activities around bedtime and wake up time. The majority of patients respond to this treatment fairly quickly. Some experience significant changes after only two weeks of treatment. Most improve after four to six weeks. The first stage of the CBTI plan is assessing the sleep. This is done by measuring sleep parameters for about a week. During that time, you need to record in a sleep diary a few crucial parameters (go to bed time, wake up time, time to fall asleep, etc.). Based on these measurements, a tailored set of behavioral modifications can be applied, and users who follow those modifications show a significant improvement in their sleep. Establish a regular morning rise time. This will help strengthen the circadian clock regulating sleep and wakefulness. Ideally, bedtime should also be regular, but for people with insomnia it is impossible to actually fall asleep around the same time nightly. When insomnia resolves, regular bedtime can further strengthen the circadian rhythm. Go to bed only when sleepy. This will increase the probability that you will fall asleep quickly. It is important to distinguish between fatigue and sleepiness. Fatigue is a state of low energy, physical or mental. Sleepiness is a state of having to struggle to stay awake. Dosing off while watching TV or as a passenger in a car involve sleepiness. People with insomnia often feel tired but “wired” (i.e. not sleepy) at bedtime. If unable to fall asleep, either at the beginning or in the middle of the night, get out of bed and return to bed only when sleepy again. Avoid excessive napping during the day. A brief nap (15 to 30 minutes), taken approximately 7 to 9 hours after rise time, can be refreshing and is not likely to disturb nocturnal sleep. This procedure is designed to eliminate prolonged middle of the night awakenings by reducing the time in bed, while keeping the sleep time. For example, consider a person who goes to bed at 11:00 PM and gets out of bed at 8:00 AM (9 hours in bed) but sleeps on average only 6 hours per night. During the first step of this procedure this person will be in bed only 6 hours (e.g., 12:00 AM to 6:00 AM). This sounds harsh but after a week or so there will be a marked decrease in time spent awake in the middle of the night. Usually people experience marked improvement in the quality of sleep after a week of restricted time in bed, but they also realize that that they are not getting enough sleep. In this case, the next step is to gradually extend the time spent in bed by 15 to 30 minutes, as long as wakefulness in the middle of the night remains minimal. Each new extension of the time in bed is followed for at least a week before progressing to the next extension. Setting a Buffer Zone: Use the hour before bedtime to unwind from the day’s stresses. This down time will allow sleepiness to come to the surface and will therefore facilitate sleep onset. This is a time to engage in activities that are enjoyable yet calming. Relaxation Exercises: Breathing exercises, body scan exercises and similar relaxation techniques can reduce arousal and help falling asleep. How can CBTI help you sleep better? We have implemented the CBTI system that was developed by Stanford University into the Sleep-Life Balance Program. The application assesses your sleep and tailors a personalized sleep improvement plan that will help you acquire the behavioral modification according to the CBTI program.